Conflict and Behaviour in the workplace can be disruptive and cause splits within teams, leading to disharmony and disruptions to workflow. 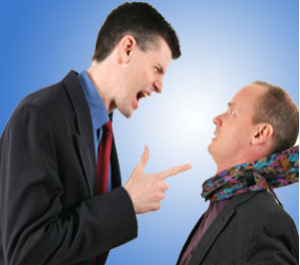 In many cases, the more negative traits will surface and result in conflict between staff members. This Conflict resolution in the workplace workshop will provide the tools and techniques for managing conflict and delegates will learn how to use positive behavioural techniques to diffuse potentially dangerous situations. ● How does conflict occur? This Conflict Resolution in the Workplace workshop will cover the causes and effects of behavioural conflict and how to manage the outcomes. There are several steps involved in the conflict model and these will be fully explained during the workshop. From a managers perspective, conflict and the impact on team members has to be understood before suitable remedial action can be taken. Delegates will be taken through the complete lifecycle of how to manage conflict and will understand how their behaviour can influence a positive outcome for all concerned. In conflict situations there may be winners and losers. Sometimes, a compromise will be reached which is beneficial for all parties concerned. However, with strong behaviour types who demand to win at all costs, a compromise may not be so straight forward. This is why it is important to understand your own behavioural type and that of your colleagues as well. The following behavioural types will be looked at in the workshop. Aggressive behaviour is at the other end of the scale from submissive behaviour. We go in absolutely determined to make our views heard and to get our own needs met. Assertive behaviour is that which is aimed at meeting our own needs as much as possible, while respecting the views and needs of other people. Submissive (or non-assertive) behaviour means not standing up for ourselves, giving way to other people, expressing our views in a cautious or timid way. These behavioural types can link in nicely with the Thomas-Kilmann model, which provides a 5 step analysis of your conflict style. Once you have understood how you rate using the TK model, it will be much easier to see how you relate to others and their behaviour and where improvements can be made. There are three types of feedback that we might give. These are positive, negative and constructive. Positive feedback involves praising a job that was well done. It shows that good work is appreciated, it reinforces what a good job looks like and it encourages others to do the same. Clearly positive feedback is beneficial and should be given frequently. Negative feedback involves criticising a job that was poorly done. It may be done in order to release emotions. It does not identify how to improve and is likely to demotivate the recipient. It also discourages innovation/risk taking and does not reinforce what a good job looks like. Clearly negative feedback is harmful and should never be given. Constructive feedback involves reviewing a job that was poorly done. It is professional in nature and does not involve venting emotions. Instead it focuses on how to make thing better and shows that the effort made and the positive aspects of the work are appreciated. All these elements and more are covered on the Conflict resolution in the workplace Workshop and delegates will take away a profile of themselves that can be worked on for personal development going forward.